You probably have your iPhone with you almost all the time, so it makes sense to use Calendar as your time management system. You can create one calendar that has everything or create a separate calendar for each area of your life, which could be as simple as work and play, or a more complex setup with separate calendars for doctor appointments, sporting events, entertainment, and deadlines. Tap Calendar on the Home screen. Tap the Calendars button at the bottom of the screen. A list of your local and remote calendars appears. Tap Edit in the upper left corner. If you turned the Calendar option on in iCloud, you find this in the iCloud section, otherwise it’s under the On My iPhone heading. The Add Calendar screen opens. 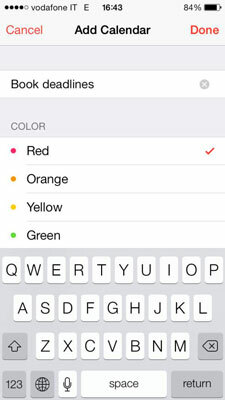 Type a name for the calendar and then tap a color you want to use to identify events in this calendar. The Edit Calendars screen appears and you see your new calendar in the list. Tap Done in the upper left corner to return to the main Calendars list. Tap Done — once more — in the upper right corner to view your events.